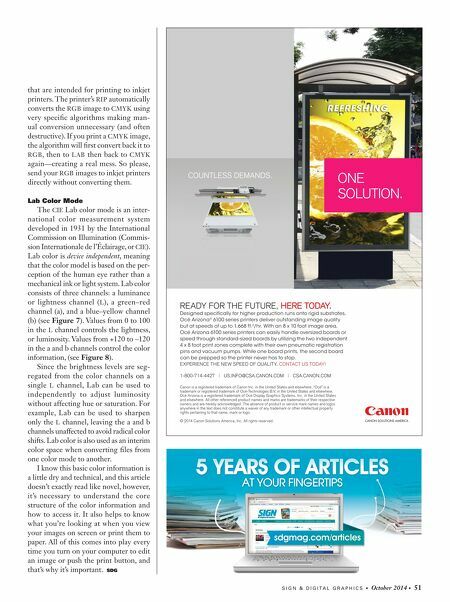 50 • October 2014 • S I G N & D I G I T A L G R A P H I C S DIGITAL PRINTING AND FINISHING DIGITAL GRAPHICS Many large-format inkjet printers use variations of CMYK inks. Sometimes there are two cyan and magenta car- tridges (light and pure) and often more than one black in an ink set. Certain printers even employ orange and green inks. When printed, the combination of colors of these additional inks can extend the gamut of color and produce richer images that have more color and tonal variation than the four basic colors of CMYK. An Important No-No Here's an important item to remem- ber: Don't convert RGB images to CMYK Figure 6: The relative densities of groups of cyan, magenta, yellow and black dots produce variations in color and tonality. Figure 7: Lab color consists of three chan- nels: a luminance or lightness channel (L), a green–red channel (a), and a blue–yellow channel (b). Figure 8: A diagram of the three components of Lab color. 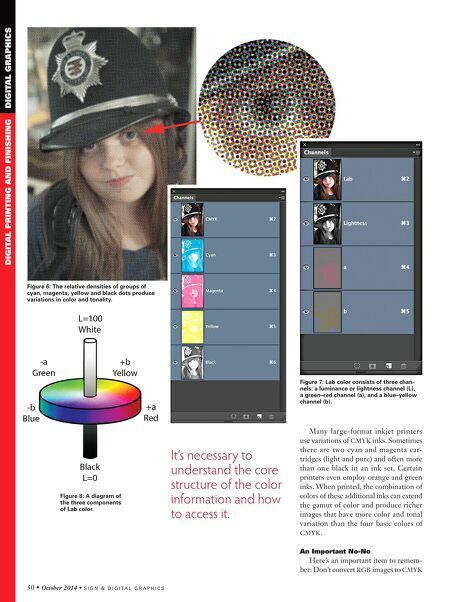 It's necessary to understand the core structure of the color information and how to access it.